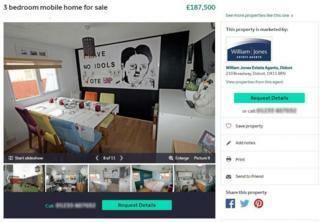 Image caption The Rightmove advert included pictures of the wall-sized mural with the words "vote BNP"
Photos of a property on Rightmove, which included a Nazi iconography and a mural with the words "vote BNP", have been removed by the estate agent. Pictures of the three-bedroom property in Didcot, Oxfordshire, showed the giant poster which appeared to style former British National Party (BNP) leader Nick Griffin as Adolf Hitler. The politician's eyes also appear to have swastikas inside them. Rightmove said it spoke to the estate agent who removed the picture. The property is being marketed by William Jones estate agents who have not responded to the BBC's request for comment, but a spokesperson for Rightmove said: "As soon as we were made aware of the image in this property listing we immediately spoke to the estate agent advertising the property on our platform and they have removed it." Nick Griffin was the leader of the far-right British National Party (BNP) between 1999 and 2014, and was an MEP for North West England between 2009 and 2014. The party was founded by former members of the fascist National Front and has been accused of anti-Semitism, Holocaust denial, and Islamophobia. During Mr Griffin's appearance on BBC's Question Time in October 2009, which caused much outrage, he claimed many people find "the sight of two grown men kissing in public really creepy". He had previously been given a suspended prison sentence for incitement of racial hatred, and when asked by then-presenter David Dimbleby if he was a Holocaust denier he said: "I do not have a conviction for Holocaust denial." He was declared bankrupt in 2014 and, after losing his seat in the European Parliament, was expelled from the BNP in the same year.